Note that there is a slider option to choose other days of the week. With restaurants, it should come as no surprise that popular times are at lunch and dinner. When clicking on the question mark Google tells us that this is “based on historical visits to this place”. When I first saw this addition to the Knowledge Graph for businesses I thought it was based on search traffic throughout the day. I was wrong. Google has enough data to tell you when these places are actually visited. With Google purchasing Android years ago they now have plenty of mobile user data to display on the front page of search. Also remember that Google Maps is used by millions of people every single day. When inserting an address into Google Maps, Google knows if you actually drive to that particular address or if you seek other options to eat lunch or dinner. For someone like me, this data is extremely valuable. I am the type of person that does not like to go to restaurants, bars or entertainment venues at their most busy times. I would much rather eat an early or late lunch and not have to wait in line or wait to get a table. 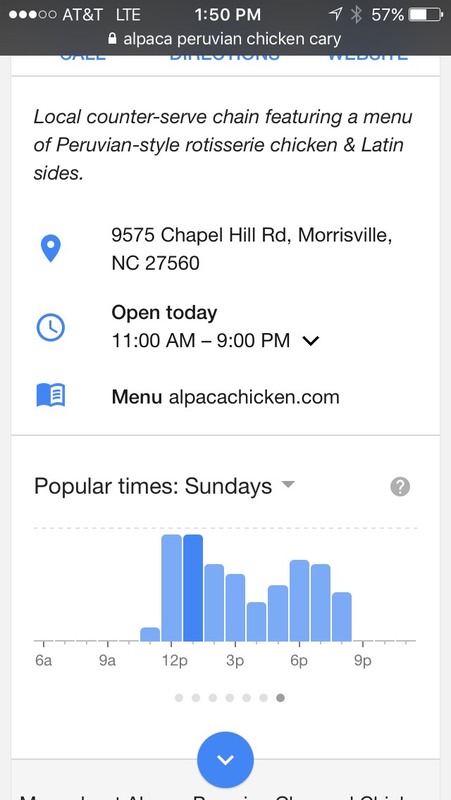 If you are like me and you do not want to make dinner reservations two weeks in advance you may want to use this new Google search feature as it will help you determine the popular times for a specific establishment. How Do I Add Popular Times for My Business? The Google Knowledge Graph is very tricky. In fact, there is little you can do to immediately see results change in the Google Knowledge Graph. Instead of trying to research how you can contact Google it is better to make certain your website is easily crawlable. By having a great website that has hours of operation and specials for the day you will let Google know you are reputable business. If you have a very weak web presence in the form of a website Google is going to struggle to understand what your business offers. That said, there are a number of businesses that have seen the Popular Times featured added to their listing yet they have no website at all. Ultimately, Google adds the data it has. If you are a very popular restaurant or entertainment venue that is searched quite a bit on Google Search and in Google Maps you are going to find that your listing on the front page of Google is much more expansive than others. I have also found that restaurants with more positive (4 star and 5 star) Google and Yelp Reviews seem to have a larger Knowledge Graph or information box. If you would like to know more about how to increase your Google presence feel free to contact me at jesse@wojdylosocialmedia.com. I have a number of monthly packages that can help you get more business from search. I also offer consulting opportunities to help explain how Google is treating your business on the front page of search. You may greatly benefit from an SEO package that will increase search traffic and ultimately increase the number of calls to your local restaurant or business.